Executive Producer, Guy V. Thayer, Jr.
Filmed on location in San Pedro-Los Angeles Harbor. Low-key melodrama with a family backgound. Hollingsworth Morse, Frederick Stephani, Paul Guielfoyle. film editors: Fred Maguire, Bob Fritsch, Danny B. Landres. Teleplay by M. Bernard Fox and Jesse L. Lasky, Jr.
director of photography: Walter Strenge; film editor: Fred Maguire. Cap'n John notices that something is wrong with the lighthouse beam. Miles Halpin (Capt. Winant); Louis Jean Heydt (Joe Johnson). director of photography: Walter Strenge; film editor: Bob Fritch. director of photography Walter Strenge; film editor: Fred Maguire. director of photography: Walter Strenge. director of photography: Walter Strenge; film editor: Bob Fritsch. their home and business when their past as bunco artists is exposed. director of photography: Walter Strenge; film editor: Danny B. Landres. Boys Choir director, Lucy Hirt. director of photography: Walter Strenge; film editor: Danny Landres. Sid Saylor; Miles Halpin; Louis Jean Heydt. With: Lois Moran, Harry Lauter et al. his first assignment pits him against his father. Bored Cap'n John can't wait to be released from the hospital; then a gangland victim checks in. director of photography: Paul Ivano; film editor: Danny B. Landres. he had a race with another diesel tug. shows? Thank you for your help. It is greatly appreciated." "My name is Bob Paulsen. My sisters name is Cheryl Ann who is 42 yrs old. tugboat and the episode pages in which I obtained your e-mail address. Question: The waterfront series, are they available for purchase anywhere? Is there a website I could turn to to see a brief film clip of Waterfront? I appreciate any information you can provide. Thank You very much." 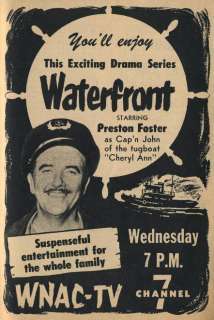 I watched the Series Waterfront with Preston Foster on Television. used to accompany Preston Foster on the Tug Boat the Cheryl Ann. She was in most of the Series.